Warts is a viral infection that mostly spread from barbers because their instruments are not properly sterilized. 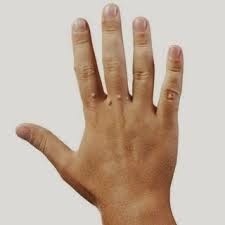 Warts commonly develop on hand and foot fingers, neck and shoulder area and especially the men’s beard area. Most men use some chemical medicines and painful treatment to cure it. Once acquired, scratching, rubbing or shaving leads to the spread of it. Scratching may result in warts appearing on fingers or around the nails and common for the warts to spread to other parts of the body. Here we have some useful natural tips and remedies to cure and treat warts. Make a paste with Figs and Carrot juice and apply it twice a week on your warts. Best tip for beard warts. Daily drink 250 g sugar cane juice to remove warts or any kind of scirrhosity in our body. Use it until required results. Make a paste with raw Garlic and apply it on warts daily before going to bed. Next morning wash it with cold water. Mix Pineapple juice with Ginger juice and apply it with a cotton swab on your warts. The best and effective tip to remove warts naturally. Mix turmeric powder with apple cider vinegar to make a paste. Apply it to the wart at night and wash with normal water next morning. Make a paste with baking soda and lemon juice and apply on affected area 2-3 times during the week. Make a paste with Banana peel off or dry banana peel off in the sun. Apply the paste on warts (mokay) for 25-30 minutes. Make a powder with lemon dried peel and mix it with water to make a thick paste. Apply it on the warts and cover it with a cotton cloth piece. Remove it after 5-6 hours, best to use it at night. To get rid from irritation of the warts just applies castor oil on the affected area by applying it with a cotton ball.